It's hard to believe that this is the 20 year old's fourth album, though it's through X Factor USA that her stardom has truly peaked. Now she has a point to prove. So far, Lovato has coped with everything her label have thrown at her - from the Avril Lavigne/Katy Perry punk-pop of her early material, to the (awful) R&B of last album 'Unbroken' and its collaborations with Dev, Iyaz and Jason Derulo amongst others. It's when she turns to pure pop, as on Give Your Heart A Break, that she most excels. As the title suggests, this is Lovato's definitive album, thankfully focusing on pop with just the right amount of sass. 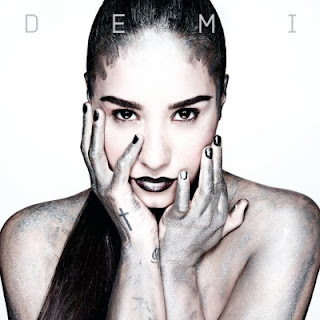 Really Don't Care is a prime example, Lovato spitting out the title lyric amongst bouncy guitar riffs. Even the middle-eight rap from Cher Lloyd is bearable. Lead single Heart Attack is the album's obvious standout - a relentless barrage of hooks with no let-up, fusing bubblegum pop and emphatic edginess. Other highlights include sing-along Made In The USA (though it's not a patch on Miley Cyrus's Party in the USA), the punky Something That We're Not, and the yodelling melodies of Never Been Hurt. Only EDM 'banger' Neon Lights disappoints due to its similarities to Rihanna's We Found Love. Ironically enough, Lovato stumbles on the X Factor-style ballads, however. Though they showcase her impassioned vocals, the sassiness turns to soppiness with clichéd lyrics and boring melodies, creating a lull in the album's middle section. The Christina Aguilera influenced closing track Warrior is also a key offender, ending the album with a snore rather than a bang. The exception is the soaring Nightingale. Eventually, though, Lovato's squeaking vocal begins to grate. Despite an impressive range, it's all belt with no subtlety - much like the album at large. But then, most pop albums aren't known for their subtlety. 'Demi' smacks you in the face with its best tracks, putting Lovato at the top of the pile of pop princesses. Listen: 'Demi' is released on 13th May. Listen to the full album here.